Located at Queen and Carlaw, Skin + Bones (@skinandbonesTO) is one of the newest additions to the Leslieville restaurant scene. The restaurant is pretty unassuming on the outside and occupies a deceivingly large space. We didn’t realize how large the space was until we were led to the dining room in the back. There’s plenty of seating along the long bar as well if you’re only here for a snack and a few drinks. I was impressed by how spacious the restaurant felt. The tables are well-spaced apart so you don’t feel like you’re dining with the people at the table next to you. It’s certainly a rarity these days! Skin + Bones has a great selection of wine by the glass (3oz or 6oz glasses) and they offer complimentary sparkling water, if that’s your thing. 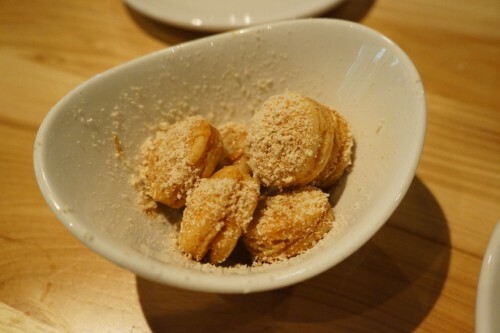 The menu consists of some interesting options such as pickled quail eggs, blood sausage and squid noodles, and is separated into several sections – snacks, apps and mains. Since there were four of us, we decided to share a few things to start. 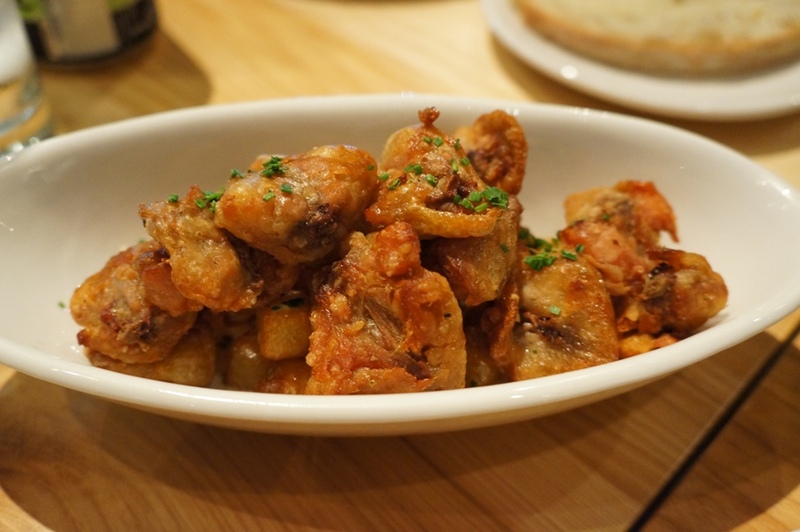 Having heard such great things about the Crispy Chicken Tails – with potato salad ($8), it was something I knew we had to order. It certainly lived up to all the hype. These salty bits of addictive chicken tails were packed full of flavour and the accompanying potato salad underneath was fantastic. A perfect bar snack! 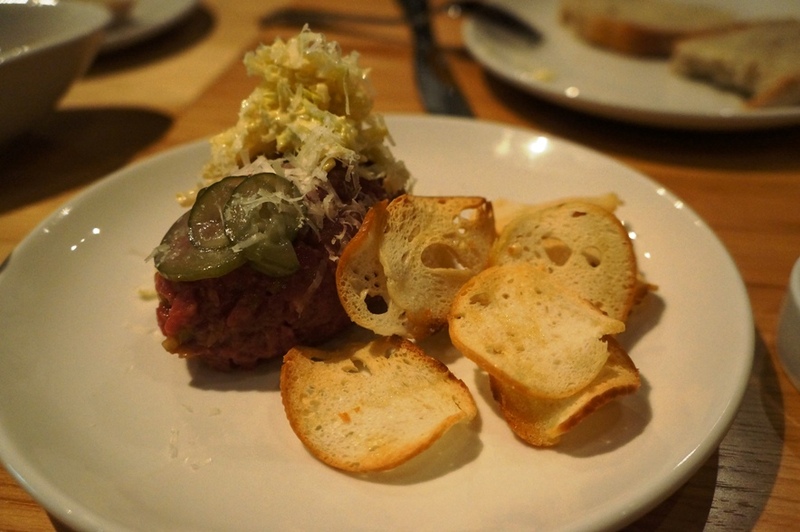 Another starter we shared was the Beef Tartare – iceberg lettuce, milk bread, pickles and “Monforte” toscano ($13). 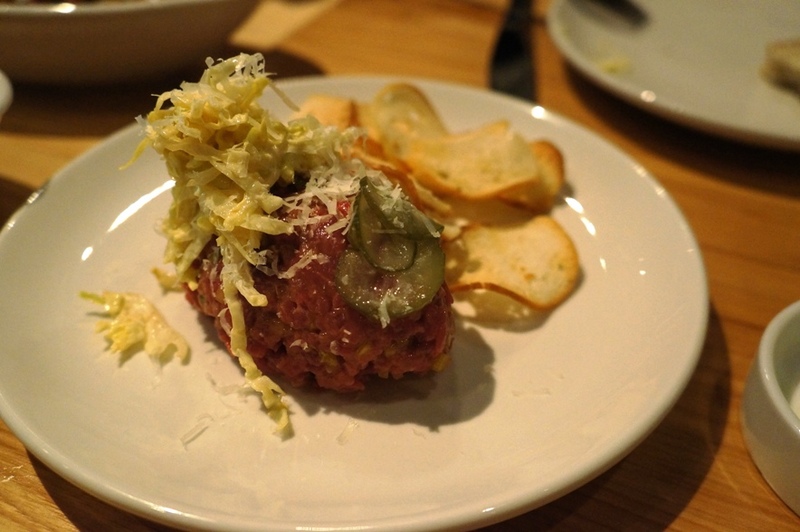 While not quite as exciting as the crispy chicken tails, it was by no means a boring tartare. 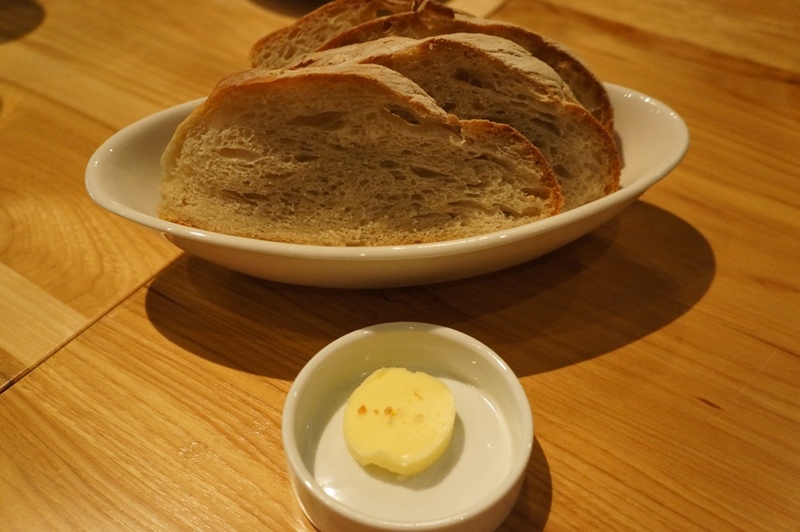 I loved that it had a strong pickle flavour and the generous portion of shredded toscano was a nice addition. 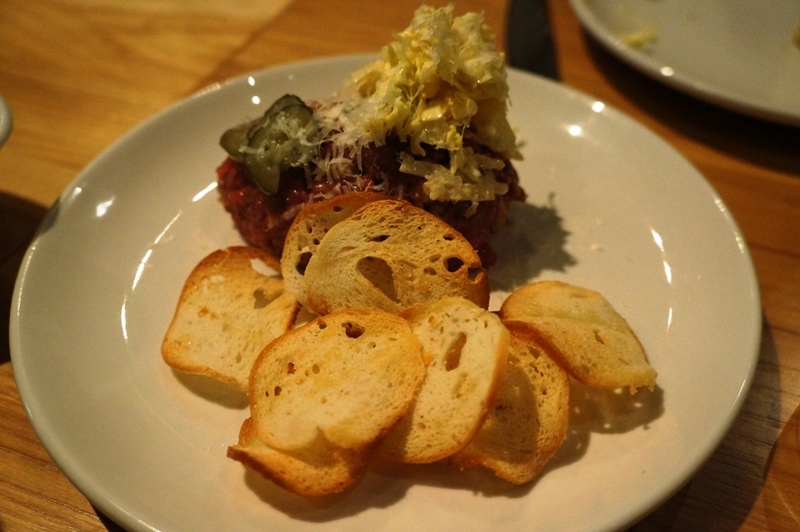 It was a damn good beef tartare which we all enjoyed. 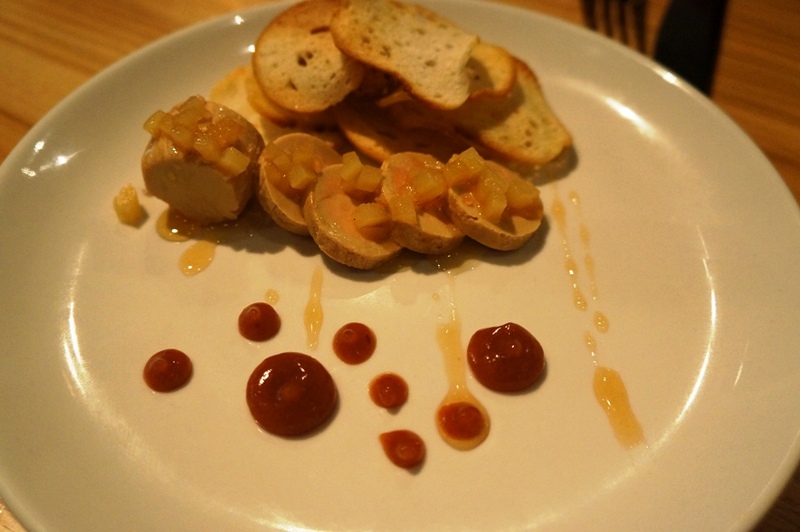 Our last starter was the Salt Cured Foie Gras – preserved quince, brioche and “L’Effet Papillon” raw honeydew ($11). 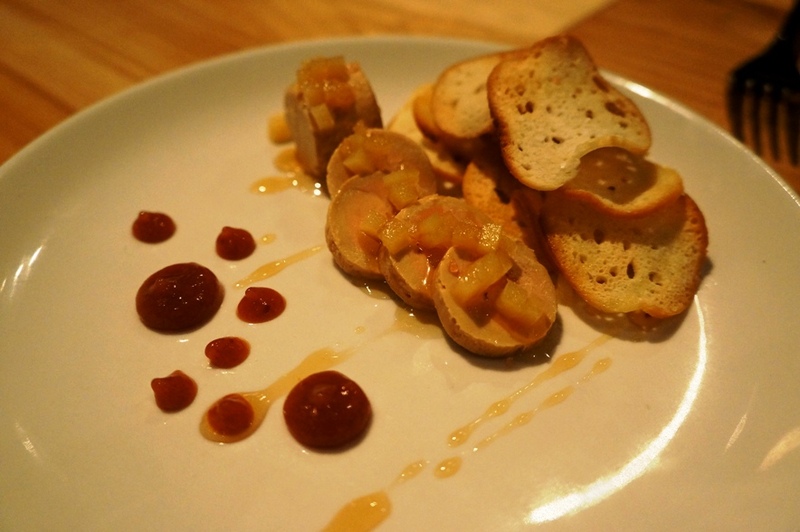 It consisted of smooth slices of cured foie gras which were to be eaten with toasted brioche. The preserved quince provided a nice sweetness to it which made it a delicious little bite. I love a good sweet and savoury combination! While deciding what entrée to order, I was a little torn since everything sounded so delicious. 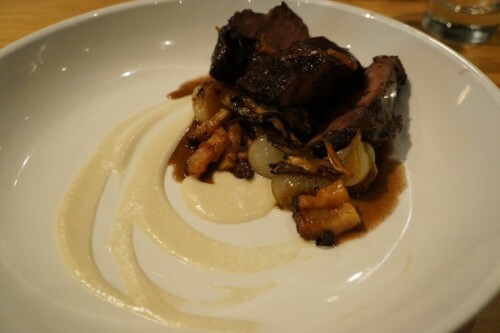 In the end, I went with the Beef Cheek Bourguignon – sunchokes, Perth bacon, roasted mushrooms and red wine onions ($23) and had no regrets whatsoever. I was surprised at the hearty portion of beef cheeks that came with the order (not that I’m complaining). 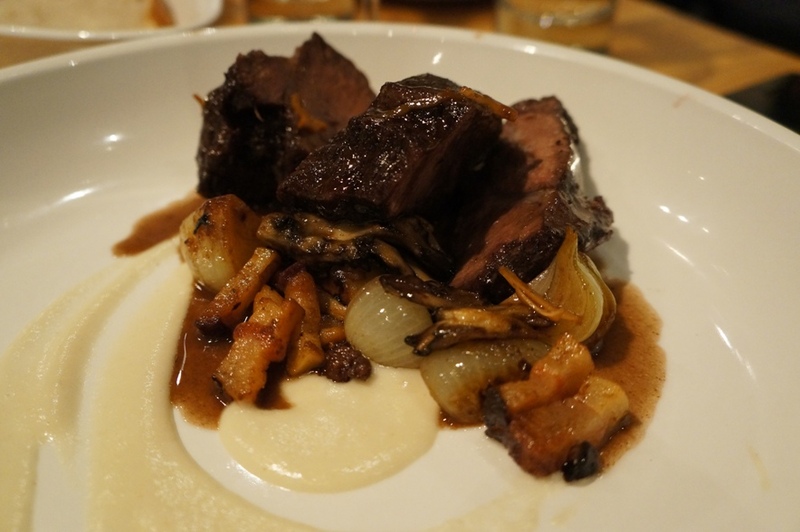 The large chunks of beef cheeks were ridiculously tender and the flavour was incredible. 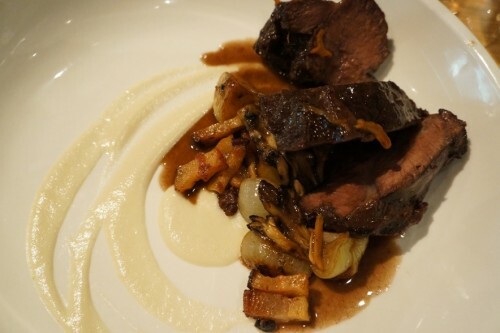 With the sunchokes, Hen of the Woods mushrooms and onions, it was a comforting dish that was perfect for the winter. Mike ordered the Chicken & Wine – slow cooked chicken, rutabaga puree, celery & white wine sauce ($19 half/$37 whole). Similar to the beef, the chicken was really tender and moist – Mike loved it but I preferred my beef cheeks. 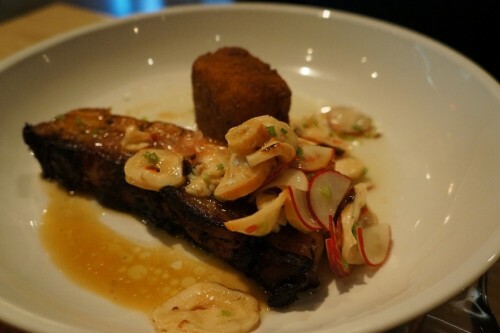 My friend Alvin ordered the Roasted Perth Pork Belly & Octopus Salad – roasted bone marrow arancini, marinated radish and parsley ($18). The dish came with an enormous piece of fatty pork belly and thin slices of octopus. 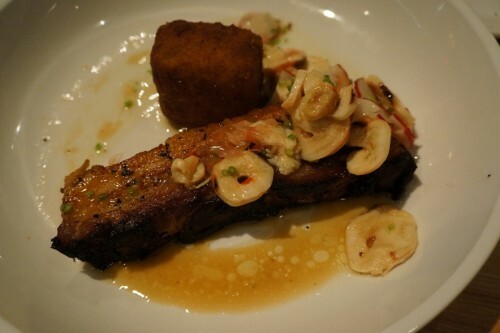 Given how fatty the pork belly was, I’m surprised the portion was so large. It made for a very rich meal! Nevertheless, the flavour of the meat was quite nice. I didn’t try any of the arancini but Alvin mentioned that it reminded him of a hash brown. Having tried a bit of everyone’s entrée, my favourite was definitely the beef cheek! There are two desserts on the menu and we decided to order both. The first to arrive was the Brioche Donuts – with caramelized white chocolate ($6). They sounded promising but unfortunately, we all agreed that this was easily the worst dish of the evening. Really disappointing given how fantastic everything else was. They tasted like dry biscuits or scones and didn’t have very much flavour to them. I think a dipping sauce would’ve gone a long way. 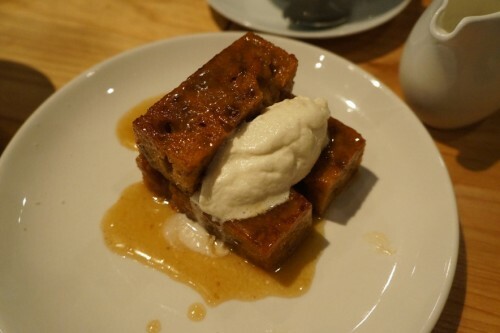 Luckily, the Sticky Toffee Pudding – with bone marrow caramel & vanilla chantilly ($6) fared much better otherwise the meal would’ve ended on a sour note. 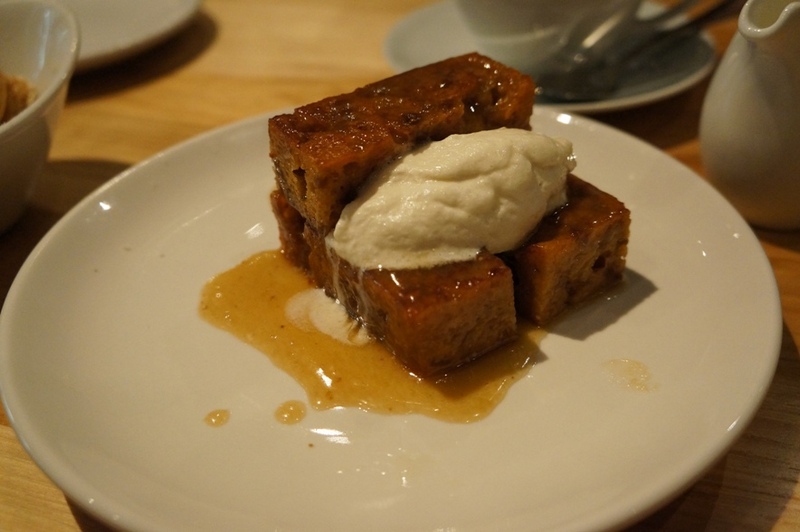 The stick toffee pudding was quite enjoyable – don’t let the bone marrow caramel scare you off! 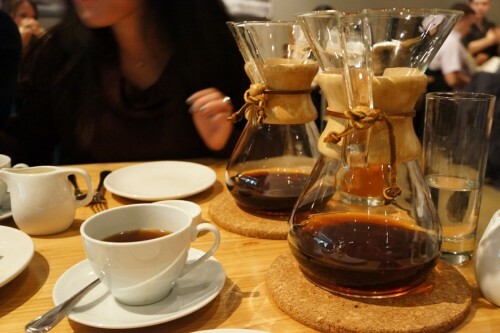 We also ordered some coffee to accompany our desserts and I was really pleased to see that they’re made with a Chemex. For only $2.50, you’ll get about 3 cups of coffee from it. 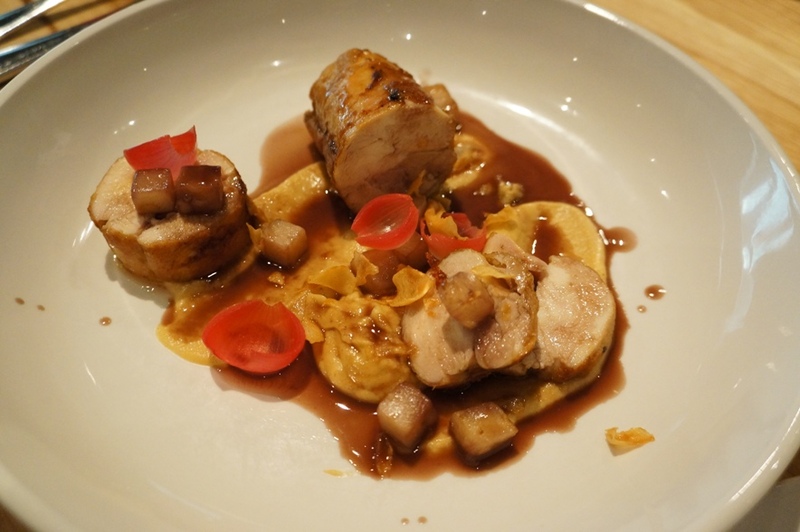 Overall, we had a great experience at Skin + Bones. 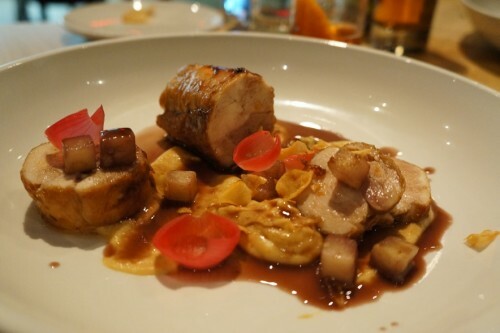 While it hasn’t been open very long, I can see why it’s already become a foodie favourite! I read Stella’s review for this a couple weeks back. Pretty sure I don’t have a choice but to hit this place up soon. What was your favourite out of everything you tasted? It’s a really great spot! My favourites were the chicken tails and beef cheeks bourguignon. 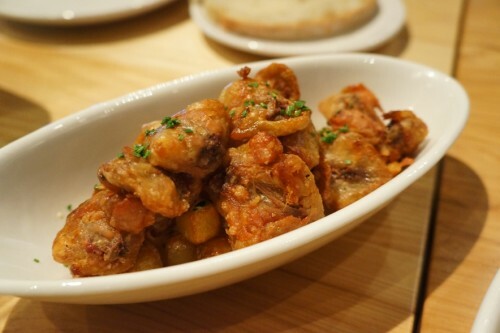 Chicken Tails and Beef Cheeks, got it! I’ll know what to order when I go!